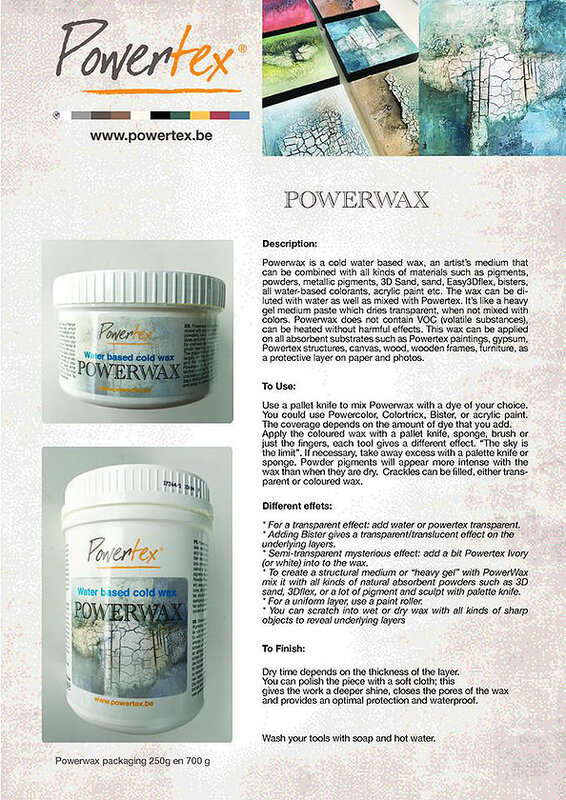 Powerwax is a water soluble, cold wax that has been newly formulated from something very old. Scientists studied the ancient paint compositions used by artists to create Pompeian wall paintings and in Roman-Egyptian mummy portraits. They discovered the beauty and longevity of water soluble cold wax and paint pigments. Water soluble and can be diluted to create transparent effects. Does NOT contain VOCs (volatile organic components). Heavy bodied, creamy paste that can be used to create impasto paintings and texture. Dries transparent in its unblended state. Compatible with paper, sand, glitter, natural elements . . .
Can be used on board, canvas, furnishings, clay sculptures . . .
Can be textured, scored, imprinted, stamped and tooled with any texturing tool you can think of. Use as a sealant or final finish over paintings and sculptures to achieve an encaustic look. Can be mixed with Powertex liquid, acrylic, oil paint, water color, pastels, charcoals, gesso and more! Powertex wax from Marion Linnenbank on Vimeo. New subscribers will receive the Intro To Powertex Series via email. Six hot topics to inspire your imagination & set you on your way to creating amazing Powertex art!